The earth shakes along with the victorious moments. Who hardly notices the pitiful demon dying at her feet. In still frame–a scene that manages to startle year after year. The demon of the evil heart, with the wrath of a dutiful goddess. 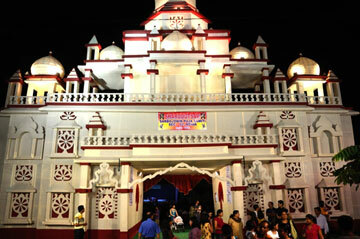 A pandal in our city. I was delighted when I found it on the web. It was way more beautiful up close. So this post was supposed to come up earlier and Durga Puja‘s already done and over with, but with all the interruptions from my sister and my father, this took a lot of time. 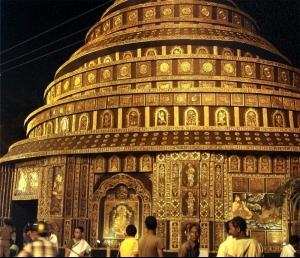 A small fact: Pandals are temporary shelters for the idols of Durga killing Mahishasur (the evil demon mentioned in the poem), her children (Saraswati, goddess of the goddess of knowledge, music, arts and science, Lakshmi, the goddess of wealth, prosperity (both material and spiritual), fortune, and the embodiment of beauty, Ganesh and Kartikeya, her two sons) along with their animal ‘vehicles’ and her husband, Shiva. 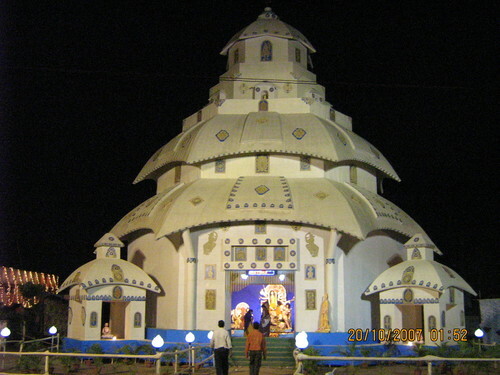 The preparations are started almost a month before Durga puja, and the pandals are demolished as soon as the last day of Puja, that is, Dashami (a.ka. 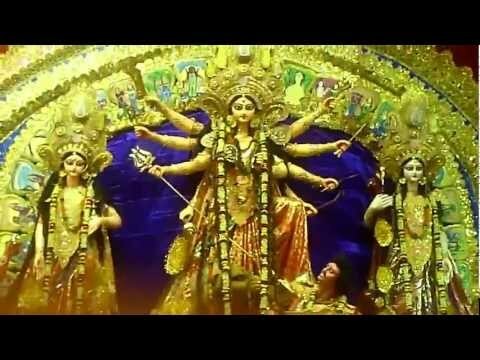 Vijaya dashami, translated as ‘victorious tenth day’ of killing Mahishasur). Pretty neat, huh?